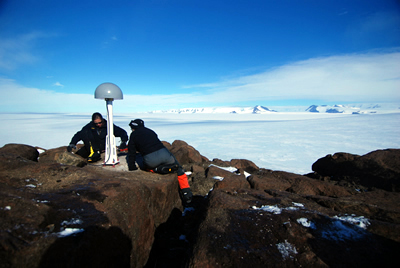 During 2008-09 field season one CGPS site was installed by plane from McMurdo and two sites were installed at or near the WAIS divide camp. Five sites installed last season were visited by plane and helicopter to perform O&M. Data from the 14 operational CGPS sites are transmitted via the Iridium satellite system to the UNAVCO Archive. One seismic site was installed and two sites were visited to perform O&M this season. 10 people were deployed in Antarctica to work on the continuous GPS (CGPS) and seismic stations. 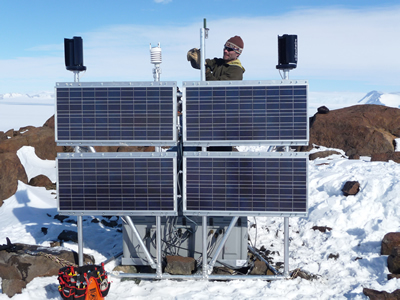 Installation of another approximately 14 CGPS stations is planned for next season to complete the US portion of Antarctica GPS network. The POLENET project is part of the International Polar Year (IPY) POLENET consortium and includes active participation of collaborators from 28 nations including the US. The project's GPS goals are to measure the vertical and horizontal solid Earth deformation to improve and test the models of glacial isostatic adjustment/sea-level change and to improve the global geodetic reference frame. Figure 1 - Thomas Nylen at Deveral Island site DEVI, installing an Iridium antenna. The system is powered by four 80W solar panels and two Forgen 500 wind turbines. Figure 2 - Stephanie Konfal and Eric Kendrick installing a GPS antenna Deveral Island.